If you find LeAnne Shor first on Instagram you may feel, like I did, instantly at home. I don't claim to bake but something about following Lion's Bread, LeAnne's passion project alongside motherhood, felt familiar, simpler and positive. Her take on motherhood and this chapter echoes those vibes. 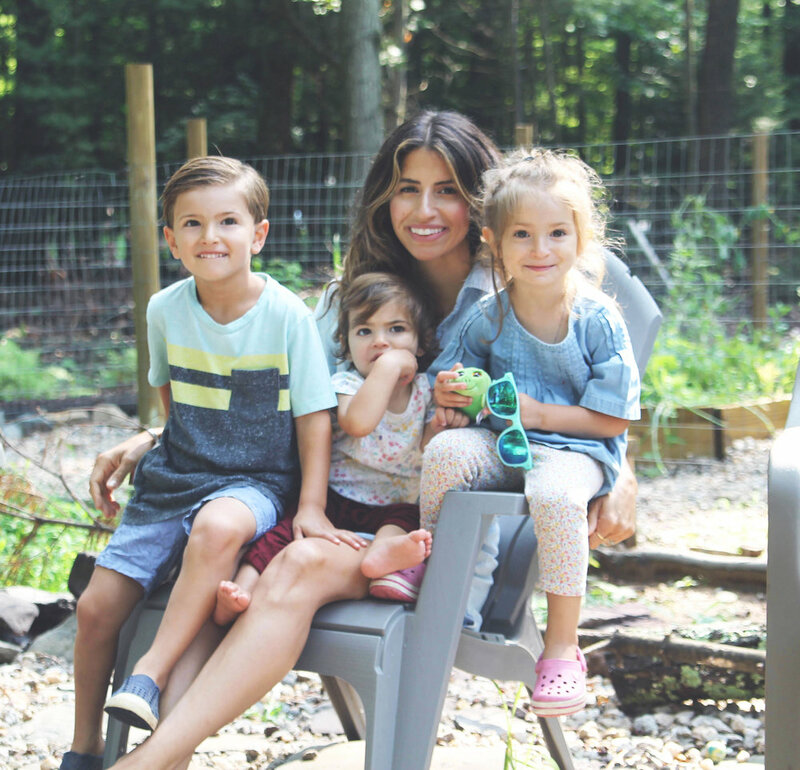 LeAnne left her role in PR and branding for her family business (her husband owns Soho based Alibi salon) knowing she wanted to be emotionally and physically present for her children's first five years. 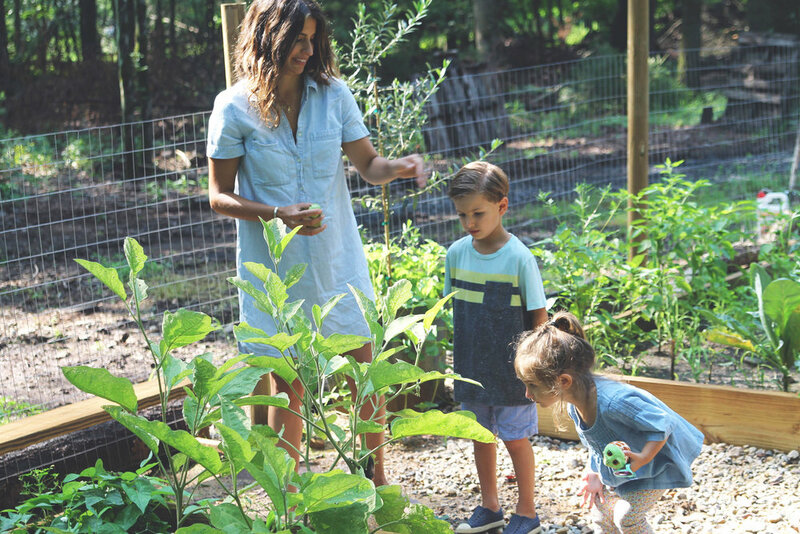 Now they have three children and made the choice to leave the city to be more grounded in nature in the Poconos mountains. Read her take on finding empowerment in motherhood, investing in her own creativity to feel whole and the transition to parenting far from family, in a different sort of village. One of the biggest adjustments for me came very early on, in the hospital the night after my son was born actually. When the nurses woke me up to breastfeed him, I realized very quickly the gravity, commitment, and adrenaline required to be a mother. I had never had anyone wake me up before, and all of the sudden I understood that this new role would demand everything of me. I'm the youngest of three, and didn't grow up with many small cousins, so becoming a mother was a really sharp learning curve for me. I needed to learn a lot in a short amount of time. Eventually I learned to lean on my own instincts and my gut feelings which became my truest compass. Now I can tap into that easier, and can read a situation and make decisions much quicker than I used to. As a Mom of three small children, five and under, I've gained more self-confidence than I thought possible. I'd say that I have always struggled with self-worth and perfectionism, but being a mother to these tiny humans has taught me how much I am truly capable of, how to fix almost anything, and just genuinely to "handle it," and that has been very empowering for me. I knew that I'd never be a helicopter Mom, quite the opposite in fact, and that sense of lax has contributed a lot to my children's creativity, social awareness, and problem solving skills that makes me feel like my investment of time, energy, and love is really paying off. My mother stayed at home with us growing up. She was available emotionally and physically, and did it all with grace and patience, and honestly made it look easy. I feel incredibly lucky and grateful for that role model. When my son was born, I knew that I wanted to spend at least the first years of undivided time with him, so I took a step back from position in the family business that my husband built, Alibi NYC Salon, where I was managing PR and branding. My focus was mainly on my son, but since work always came home for us, I felt like I still had one toe in the game. In that time I had my daughter, and quickly got pregnant again with #3 (the girls are 18 mos. apart), I decided to finally prioritize my own passion project, and start my baking and cooking blog Lion's Bread. Putting myself out there and investing in my own creativity was really scary for me, but I knew it was a risk that I had to take in order to feel like my creativity was still alive. I would still choose to spend undivided time with my kids, but finding childcare that I can truly trust and feel comfortable with has been a big struggle for me. We live very far from both, mine and my husband's family (California and Israel), and if I had to do it over, I would choose to be closer to one of our families to have that support system. Affectionate. Nurturing. Tough. The fact that I was so hands-on for every aspect of motherhood so far feels rare, incredible, and exhausting. I really feel "in it" most days, but no matter what the day brings, I try really hard to show them kindness, patience, and respect. That being said, being a Mother is SO hard. I have toughened up so much, for the sake of survival of one more meltdown, one more potty accident, one more sleepless night. My love language is not surprisingly food, and cooking, baking, and sitting down to a meal with my family is everything to me. I want these values and sense of family to build their confidence by giving them the freedom to explore, make mistakes, and discover, because they feel safe at home. I was taught to raise a child in the way he/she should go. I really hope to be in tune enough to each of them to see their individual gifts and potential and help them reach it by giving them the right tools. I feel like this is the easiest question to answer. I know what I need, and it's a list. 2. Time to ride my horse, and be in nature. I've ridden horses since I was 6 years old - it is my therapy, and the only way I can actually clear my head and relax. 3. Writing Lion's Bread, creating content, networking with other creatives, and flexing my brain to learn new skills (web design, photography, styling, and branding). 3. Genuine conversations with the powerful women in my life. Some are mothers, some are not, and I feel like I learn so much from all of them. We lift each other up, and are really honest with other. This is definitely the aspect that I struggle with the most. We live in the Poconos Mountains in Pennsylvania, which isn't close to either of our families, and I feel like I do most of it on my own. We chose to leave the hustle of NYC for a quieter life that is more grounded in nature about a year ago. My husband commutes to the city a few times a week, so we're close enough, but also far enough. My son was showing signs of anxiety at a very young age, and I attribute much of that to the fact that he was an incredibly energetic young boy in a small confined apartment with zero independence or freedom to play like an active 4-year old should. He clearly had too much energy and he needed space and freedom. I wanted to be able to go outside and explore with my kids, grow a garden, raise animals, ride horses, and hike. I see a big difference in his behavior since we've moved out to the country, and for me that is worth it. It's pretty wild out here, every day feels like National Geographic, no joke. I was worried that moving out here would mean losing touch with our really close friends in the city, but I find that the opposite has been true. Since we're in a destination-type area, friends and family have all the more reason to come visit. I've made a few good friends here, and our neighborhood is full of other young families and neighbors that have gone above and beyond to be welcoming and helpful as we adjusted to our new life. But I still feel like I'm in a long-distance relationship with my family and my husbands', and that will always be hard for me. I see the the connections between self, wife, and mother like a venn-diagram. They overlap often, and it can be difficult to differentiate. My focus for the past five years has been primarily on my role as a mother, and I'm working on balancing out the other two spheres. I sometimes joke that I can't be everything to everyone, so I just neglect them all equally, and there is a bit of truth in that. I'm working on not micro-managing every aspect of our lives to let them figure things out and be independent. Also, patience. More patience.